Junior business major J.D. 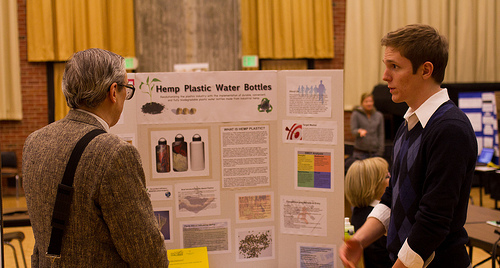 Leadam won first place in several categories at the Silicon Valley Innovation Challenge for his entry, Hemp Plastic Water Bottles (Dillon Adams photo). Nearly 200 Spartans competed Dec. 1 in the Silicon Valley Innovation Challenge, including junior business major J.D. Leadam, who took first place in several categories, winning $2,000. “I learned that if I truly believe in an idea, then I can sell anyone on it,” Leadam said. Leadam won Most Innovative Idea, Best Elevator Pitch, and People’s Choice awards for his entry, “Hemp Plastic Water Bottles,” an idea that replaces single-use water bottles with biodegradable plastic water bottles made from industrial hemp. Leadam plans on entering the Silicon Valley Business Plan Competition this spring, using the money that he won from the challenge to make a prototype and contact manufacturers in China. “I am really looking to make this happen,” he said. Other projects included ePrepared, an online community providing counseling sources for high school and college students; Applications Complete, an innovative way to track everyday receipts; and Spherical Drive System, a new concept for a motorcycle designed to balance like a Segway. This was the first time The Silicon Valley Center for Entrepreneurship, within the College of Business, extended its signature fall event to all majors. Undergraduate and graduate students, as well as alumni from all seven colleges participated. President Mohammad Qayoumi and College of Business Dean David Steele presented the winning awards. “I think that we were successful in creating a cross-disciplinary collaboration for our first year,” SVCE Director Anuradha Basu said. 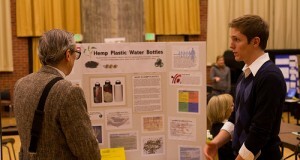 Over 25 community members helped with judging the exhibits and the elevator pitch contest. They included 11 CEOs/founders, two attorneys, two angel investors, two venture capitalists, a banker, and four managers from Cisco and Intel. Around 10 judges were SJSU alumni. Included on the panel of judges were Arlo Inc. Co-founder Dave Hadden and Tower Foundation of SJSU Board Member Wanda Ginner, who headed her own independent CPA firm for several decades. Hadden felt his experience was his biggest contribution.